Cubic zirconia (also called CZ) is a synthetic crystalline substance used as an affordable alternative to diamonds. Though much less expensive than diamonds, the brilliance and crystal clarity of cubic zirconia make it one of today's most popular stones for an attractive-yet-inexpensive, diamond-like jewelry. Cubic zirconia is not a mineral; it is a man-made substance, not to be confused with the natural gemstone zircon. In 1937, German mineralogists discovered the natural mineral form of the gemstone in a single site. It has never been found in nature again. The current synthetic version of cubic zirconia stone is a crystalline form of the metallic element zirconium dioxide. It was first produced in a laboratory in 1977. Cubic zirconia crystals are made by melting powdered zirconium and zirconium dioxide together by heating them up to 4,982ºF. Unlike diamonds, cubic zirconia is simulated to be flawless. CZ can be perfectly structured, free of inclusions, totally transparent and possess a brighter fire. Like other gemstones, cut, size and shape influence how light is refracted and will affect the stone's brilliance. Like diamonds and other gemstones, cubic zirconia has is own grading scale to measure quality. A colorless cubic zirconia is extremely difficult to distinguish from a diamond, and appears identical to the untrained eye. While a diamond is a naturally occurring gemstone, cubic zirconia is simulated. Diamonds are the hardest gemstone in the world, a 10 on the Mohs scale of hardness. Cubic zirconia is softer, but still considered a hard gemstone with an 8.5 rating. The denseness of cubic zirconia makes it about 75% heavier than diamonds. Cubic zirconia tends to contain more flashes of color than the typical diamond. CZ's very high refractive index and transparency mimic the look of the most expensive diamonds in clarity and brilliance. Cubic zirconia does not have cleavages, making them less brittle and susceptible to chips and cracks than diamonds. Cubic zirconia is used in rings, pendants, bracelets, earrings, other pieces where you might find diamonds. It is often set in valuable metals like gold, sterling silver and platinum. The gemstone is available in a variety of attractive colors, which are made by using different oxides. Colored cubic zirconia is extremely popular in fashion jewelry. Cubic zirconia is cut in the same shapes and styles as diamonds. 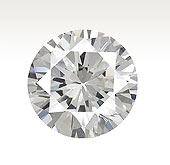 Learn about diamond cuts and styles in the diamond buying guide. Absolute™ is a leading brand of cubic zirconia. Absolute delivers the look of a diamond without the high price tag. Accomplished jewelry designers create signature collections using Absolute. Creative minds like Victoria Wieck and Jean Dousset among others make their coveted work accessible for all budgets by working with cubic zirconia. Contact us for your Your Ideal Loose CZ Stones,Loose Cubic Zirconia Stones from China Wuzhou Supplier and Manufacturer. 0 Respones to "Zirconium Loose CZ Stones Shopping Guide from China Supplier and wholesale"